8mm Round Rubber Shock Beads in Green and Brown Mix. Designed especially for helicopter rig set ups and a perfect fit on leadcore, these soft 5.5mm beads are housed on a handy frame which is a perfect size for storing in the tackle box. The frame contains 20 beads, 10 with a large bore and 10 with a small bore with a central membrane. 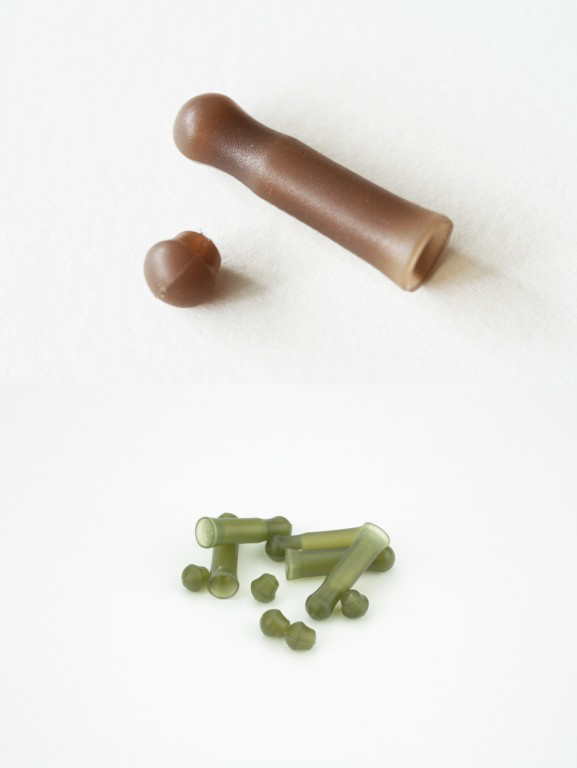 The large bore bead is a perfect interference fit over the 0.5mm silicone tube supplied with the beads. This is designed to be fished as the upper bead on the leadcore leader, so that in the event of a break off the bead can easily pop off the silicone tube under minimal pressure, and slide over the leader knot, allowing a hooked fish to rid itself of the leader. 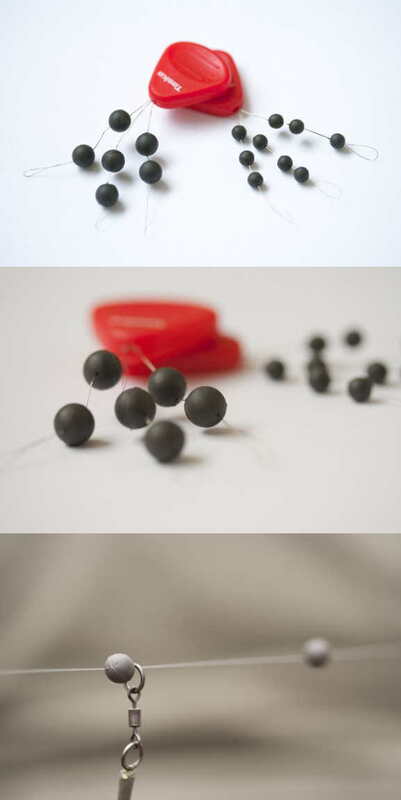 8mm beads provide the perfect shock absorber when used in running lead and marker float set ups. The tapered bore provides a perfect fit for the eye of a ESP size 9 carp swivel. Specially designed for streamlining helicopter rigs and connections. Smooth flowing aerodynamic tapered design removes edges that could cause the hooklength to tangle. Essential items for reducing tangles by sheathing Speed Links & Easi Clips and are ideal for tidy running rigs & marker float set ups. X-Long length improve the performance of chod and helicopter style rigs. 4mm diameter is the smallest size for holding a Flexi-Ring Swivel in position, making a neater overall set up. Specially designed to hold swivels in place but release them if the lead becomes snagged creating safer semi-fixed lead rigs. Smooth flowing rounded design removes edges around the swivel that may cause the hooklength to tangle. Green luminous beads available in various sizes. Buffer beads that fit firmly on Chameleon anti-tangle tubing. Manufactured in the latest shock absorbing soft grip material. Ideal for running rigs and marker float set ups when knot protection may be required. 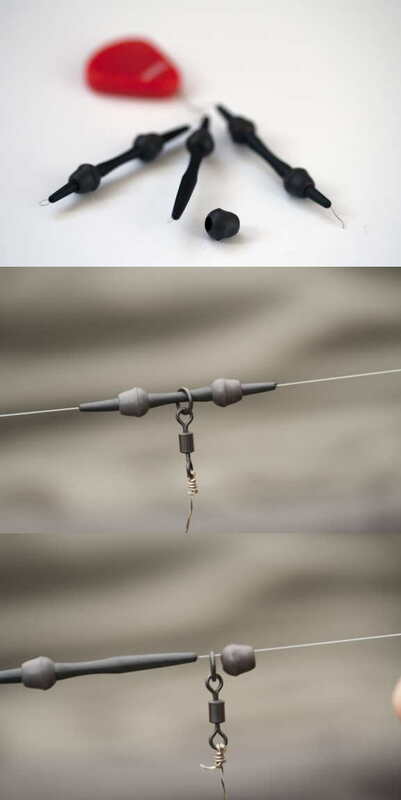 Designed to fit snugly on to anti tangle tube to lock in place the hook link swivel for chod or helicopter rig set ups. Taska Oval Baseline Beads are ideal to cover knots and give them that extra bit of weight, ideal for Stiff hinged rigs and similar purposes. This specially designed Helicopter sleeve is suited to use with leadcore or tubing, the outer profile has a superb anti-tangle property whilst the inner profile has been designed sit neatly on the lead, comes complete with a profiled beads to help you construct a safe helicopter rig. Sits neatly on the lead. 10 pieces of each per pack. 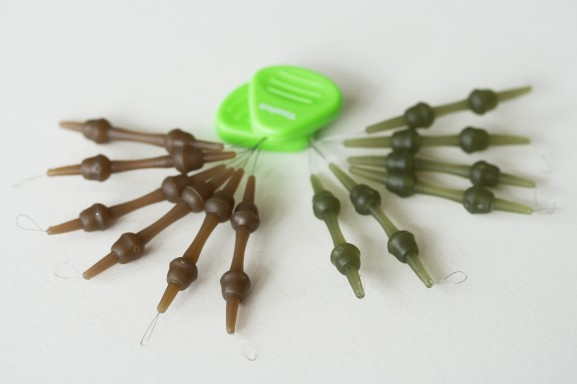 This purposely designed Chod Bead System takes Chods to a new level. Being a Taska Baseline product it incorporates our very unique Tungsten compound. The unique tapered design on both ends makes sure the tungsten beads are fixed and the swivel is trapped in between. Due to the extra weight you will no longer doubt if your set up is sitting where it should. Taska Solid Tungsten 6mm Beads are a unique first, they are perfect for use in creating the naked chod rig, where less is more. They come on wire loop so all you need do is thread your line through the loop and slide it on.